Rahmat Umm Sumayya, nasib qilsa biz ham Hajjga tezroq borishga niyatimiz bor. Sog’liklarimiz yahshi alhamdulillah. Ibrohimga maktab rosa yoqib tushdi, u full time boradi. Math’ni yahshi korgani uchun ko’p math qilisharkan. Sarah abeddan keyin boradi, uniki ko’proq ingliz tilini praktika qilish bolyapti. Maktab paytgacha uyda dars qilamiz. Unga arab tili, tajweed kitoblari yoqadi alhamdulillah, yahshi korib dars qiladi. Ibrohimgayam kunda ozgina arab tili, tajweed qildiraman lekin Sarah’chalik yugurib kelib, hohlab qimeydi. Quron qaytarashadi, yangi suralar organishyapti kunda. Ikkovlariyam ozlari yahshi kor’gan fanlari yahshi korib qilishadi, oson organishadi. Uncha yoqmaganlarini har hil yo’llar bilan o’rgatishga harakat qilyapmiz. Nasib qilsa comment yozib turishga harakat qilaman. 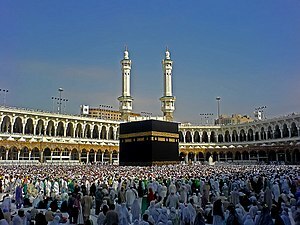 Umm Sumayya, Alloh qabul qilsin Hajj ibodatingizni. Hursand bo’ldim eshitib mashaAllah. Bolalariz sog’ingan bulsa kerak ketganiylarda? Homeschooling ham yahshi ketganida hursandman, davomli bo’lsin inshaAlloh. Masha’Allah sister. Praises to you for all the hard work you are doing for your family. I’m homeschooling my 6 and 4 year old daughters (I have a 1.5 year old son as well). I know that it is not easy and takes a lot of you but at the end you do love how you positively (insha’Allah) influence your kids life and become closer to them. I have a question for you though. You mentioned that it takes you 2 hours in the morning then another 2 hours in the afternoon for Islamic studies. For me, however, I try to finish everything at once with breaks in the middle when needed. I tend to start with my oldest at 8:00 A.M. then my younger joins in an hour or two later. Between joggling things with all three kids (especially that the little one is sooooo demanding!!!) and we usually end by 2:00 PM … We always cover English, Math, Arabic and Quran on a daily basis then we add history on Mondays, science on Tuesdays … Art and typing on Wednesdays and Spanish on thursdays …Fridays are Islamic studies and arts and crafts day before we head to the mosque for Jumma … anyhow, so everyday after school they have dinner and there is always something scheduled in the evening. On Mondays, it’s library day. Tuesdays are girls scout … Wednesday nature class in the park … Thursdays free play day either at the park or play area in the mall nearby … Fridays are family fun day … and we always tend to do something fun on the weekend .. My fear is that 8 – 2 is pretty long for my oldest one (although that is what the online curriculum I am using (K12) requires) … alhamdallah she is doing well and very responsive and compliant … I just fear that as she gets older she will get bored and hate it. Do you have any recommendations sister as to what I should do to make it shorter and more concise? MashAllah, you sound very busy sister. May Allah reward you for your hard work. May I ask you a few questions to answer your question lol. How often do you evaluate your lessons/teaching style/learning? And how do you evaluate? What I suggest is sister, take some time out and evaluate your homeschooling. Observe your daughter over a period of a week or so and analyse the whole situation. Be honest with yourself and answer some questions such as Does she enjoy learning? Do you never force her? How do you keep her aptitude for such a long period? Is she passionate about each subject? How long each subject lasting for? Is she not bored during that time? The activities you provide- are they hands-on/practical/fun to do etc. From a personal experience, our principals for learning is have shorter lessons, varied order of subjects with varied order of activities. So, have some formal work on the table followed by hands on/fun activities where some movement is involved. Or have arts/crafts where they make something etc.